Have you ever visited the pyramids? I have but a long time ago. My boys went there once but I’m sure they would not remember that trip because they were so young but my daughter hasn’t yet. A long time ago, going to the pyramids was one of the main school trips and of course, it was always during the winter. 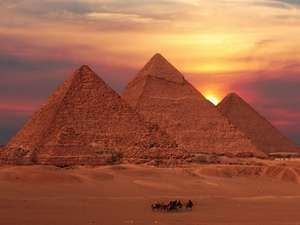 They are beautiful; three pyramids; stand together not far or so close. The stones used in the building are amazing; they were collected or cut from a quarry, transported in boats sailing over the Nile, pushed over the dampened sand in huge sledges which were dragged by horses, camels and well-fed builders. At last, those stones were hauled through ramps over ramps over ramps until the building was done. How those ramps were exactly constructed is still one of the ancient Egyptian mysteries! Do you think the Pharaohs had built these Pyramids to be one of the seven world wonders? Or to enter Guinness World records? Definitely NO. These pyramids were built to be tombs; sacred, powerful and maybe cursed too. The Pharaohs believed in immortality. Their corpses and food were mummified. Their jewellery, money and other special items were locked in their tombs too. Their Statues were sculpted and placed in magnificent temples. Paintings of their images and life were carved on the walls of tombs and temples. Why did they think of those complicated procedures? They did all that because they believed in life after death. They believed their souls would come back to their dead bodies and they would rule and live but in a different way; not as a supreme ruler but as a god. This is why the heart was the only organ to be left in the dead body. This is also why they locked all their valuable and precious things in their tombs. It is also said that Pharaohs cast special spells to protect their tombs. I don’t like to get inside the pyramids; so dark and humid; besides it is not well ventilated especially with so many people. And the most important thing is not to get the Pharaoh’s curse (joking). This was many years ago; maybe things inside have changed. Let me know if you have ever been there.